Designer babies are the kind of hypothetical conundrum that drive scientists crazy. What if, you ask, it becomes so easy to pick and choose which traits we desire in our children that we wind up creating a class of genetically engineered super humans and basically begin living out a real-life performance of the novel Brave New World? Yeah, what if, most scientists would respond. But rapid advancements in the realms of both reproduction and genetic engineering do require that we begin parsing the ethical quandaries that these science fiction scenarios suggest. Already, in vitro fertilization (IVF) allows parents-to-be to select desirable traits from huge, carefully curated catalogs of sperm and egg donors. How much further are we willing to go? A group of scientists and bioethicists is concerned with how one new reproduction technology in particular might make a future of designer babies far more relevant. In vitro gametogenesis, or IVG, is a technique that could allow any kind of cell to be programmed into a sperm or an egg cell. This means, theoretically, that you could go on a terrible Tinder date, never make it past drink one, and a few months later get a call informing you that your ill-suited suitor had taken your skin cells and transformed them into sperm or an egg because while you might not have been the perfect romantic match, your genetic makeup was alluring. IVG, he said, might allow you to very easily produce a large number of embryos, and CRISPR might allow you to then easily edit those eggs and simply select the most attractive genetic options prior to implantation. This scenario is indeed still a ways away. So far, IVG is a technique that has only been demonstrated in mice. And CRISPR, while often described as a tool for simply “cutting and pasting” DNA, isn’t nearly that accurate just yet. That nightmare Tinder scenario still requires advancements in technology, as well as changes to regulatory policies in places like the US, where genetically engineering a human embryo is illegal. Ethical quandaries aside, IVG would be an incredible achievement for women having difficulty with pregnancy, allowing doctors to create eggs from other cells even if they have no viable eggs left. This is in part because of key differences in the technical details of how one would go about editing the genes of embryo with IVG versus IVF. Currently, if you wanted to edit an embryo, you’d have to do it once the sperm and egg had already fused, and then hope you got a couple embryos with the desired traits and no off-target effects. If you’re working the stem cells, however, as in IVG, those cells might be edited before they become an embryo, meaning a virtually infinite numbers of cells can be throughly vetted before anyone even gets around to the embryo-making process. “The reason IVG is so potentially disruptive is that it enables exhaustive quality control of cells that have undergone gene editing,” said George Daley, a stem cell researcher at Harvard and co-author of the paper. Cohen said that the suggestion isn’t that IVG not be considered as a viable fertility technology. Instead, he had his co-authors suggest a rigorous evaluation of the ethical implications before the technology has advanced too far. 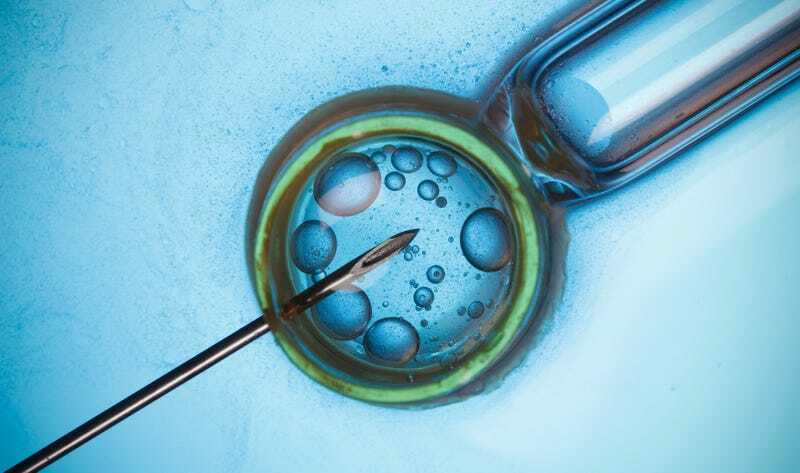 The UK’s approach may be a good guideline: while most other nations have outright banned genetic modification of human embryos, the UK allows it in very specific scenarios, such as to cure rare mitochondrial diseases. In the mean time, don’t fret: For now, as long as you keep your pants on, your Tinder swiping should be baby-free.